At the last protest march my husband and I attended, he took this picture. All I can say in response to this man’s t-shirt is “Amen.” You don’t truly appreciate intelligent, rational discourse, presidential integrity, compassion or a president’s impeccable sense of humor until those things are gone. We are living in a time of stark contrasts, hoping the pendulum will swing us back toward sanity and an opportunity to restore all that’s being torn down, torn asunder, or trampled. 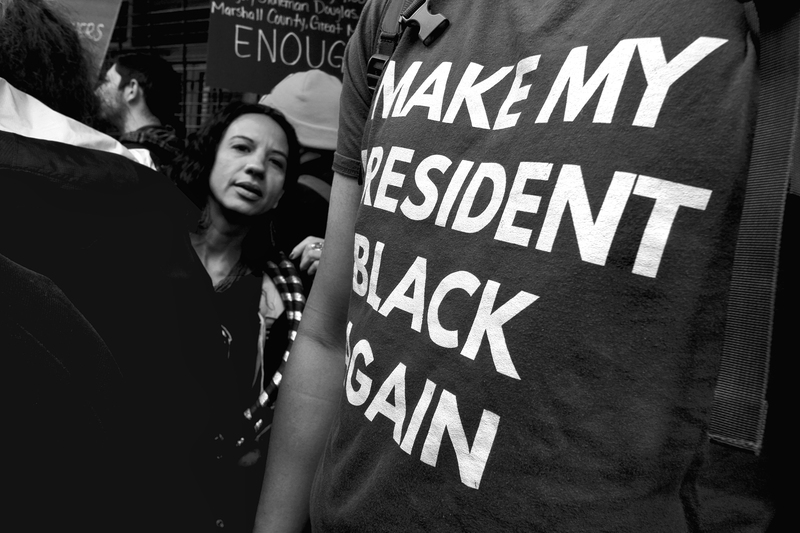 This entry was posted in black and white photography, photography, street photography and tagged black and white photography, Obama, protest march, resistance, street photography by Redzenradish. Bookmark the permalink.